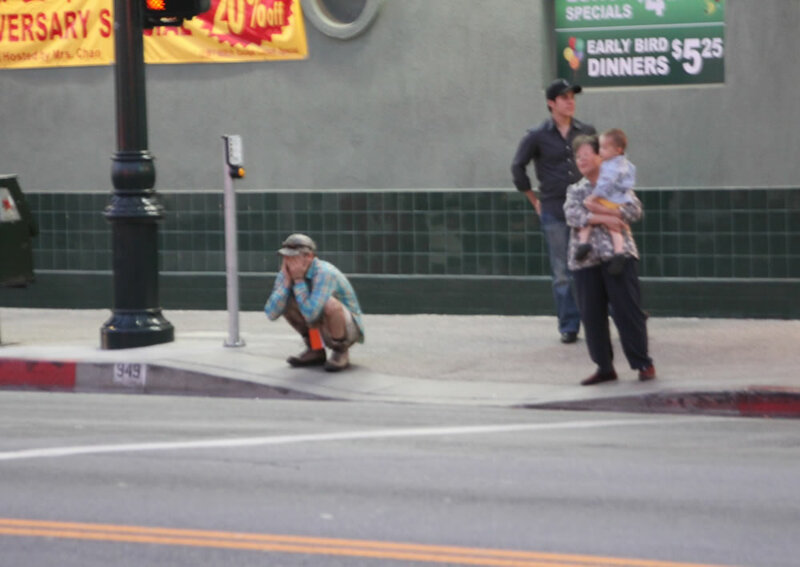 Synthetic Ritual brings together a number of Los Angeles and international contemporary artists working in a variety of media including installation, drawing, performance, and video. The artists explore the idea of ritual as a faith-based activity that can be validated only within certain contexts—for example sport, religion and artistic practice—and cannot be rationally proven or substantiated. The exhibition examines the presence of ritual and superstition in our professional and personal lives and asks why, in such an advanced and sophisticated technological and cyber driven world, ritual still occupies such an important and dominant role. Exploring the three central themes of ritual in relation to sport, religion, and artistic practice the artists provide refreshing and surprising commentary on ritualized behavior in the 21st century. Elaborate ritualized behavior by sports fans and players dominates the world of sport. Whether it involves wearing the same unwashed jersey throughout the season, sleeping with a baseball bat to overcome a hitting dry spell, boxers drinking blood before a prizefight, repetitive rituals performed by baseball players with their gloves or feet before stepping into the batter’s box, fishermen avoiding the path of barefoot women, all of these behaviors are regarded as acceptable decorum; yet when isolated and examined, free from the clutter of a falsely normalizing setting, they are utterly absurd and hardly distinguishable from madness. Similarly, sociocultural practices such as occultism or Freemasonry—as well as more conventional religions like Christianity or Buddhism—are sheathed in secrecy and cryptic codes, and all require adherence to specific practices and costumes. Whether it is transubstantiation or reincarnation, each has its own particular set of rules and fantastic belief systems that require faith in the irrational and the unproven. Tic disorders, obsessive-compulsive behavior, and repetitive involuntary movements have legitimate expression in many artworks today. Examples abound, this century and last, in expressionism, abstraction, conceptual, pop and performance, and can be seen in work as far apart as Roman Opalka’s mapping of numbers one to infinity and John Bock’s Paul McCarthy-inspired deranged personae performances. Whether artists are using these “syndromes” as systems to make the work—process, series, repetition—or evoking these states to call attention to social/political/cultural aspects, the list of artists is extremely long and likely to grow. Common to all these practices and activities—whether athletic, religious or artistic—is their reliance on behavior that is obsessive, repetitive, irrational, and unsubstantiated. The work of the artists in Synthetic Ritual all reference or employ some form of ritualistic behavior that, if taken out of the context of art, would be regarded as aberrant and unstable. Mounira Al Solh, The Sea is a Stereo, Let’s Not Swim Then! (2007-08). Video, 50 minutes. Courtesy of the artist and Sfeir-Semler Gallery. Mounira Al Solh’s The Sea is a Stereo (2007-ongoing) documents the daily swimming habits of a group of middle-aged Beirut men, who regardless of circumstance—turbulent weather or bombing raids—are compelled to swim in the sea at the same spot everyday. With the backdrop of incessant violence and interminable conflict, their rigid swimming ritual becomes an act of defiance in the face of the uncertain and chaotic times and creates unity among them. Meris Angioletti, I Describe The Way And Meanwhile I Am Proceeding Along It—Studio (2009). Single-channel video installation, theatre light, green gelatin. Courtesy of the artist. 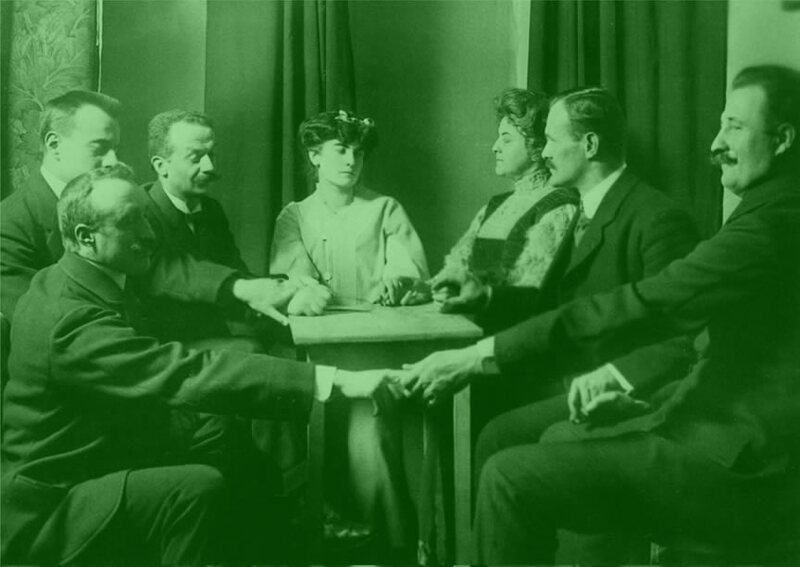 Meris Angioletti models her practice on the methodologies and procedures of a detective, psychoanalyst and historian, allowing her to assume a number of different roles and experiment with diverse strategies. The video installation I describe the way and meanwhile I am proceeding along it (2009) examines the highly influential 19th century abstract painter, mystic, and suffragette Hilma af Klint. Beatrice Catanzaro, THE WATER WAS BOILING AT 34° 21’ 29” SOUTH, 18° 28’ 19” EAST (2008). Single-channel video installation, 16 minutes. Courtesy of the artist. The Water was Boiling at 34º 21′ 29” S, 18º 28′ 19” E, (2008), is a video work which takes the form of an interview between the artist and P.C. 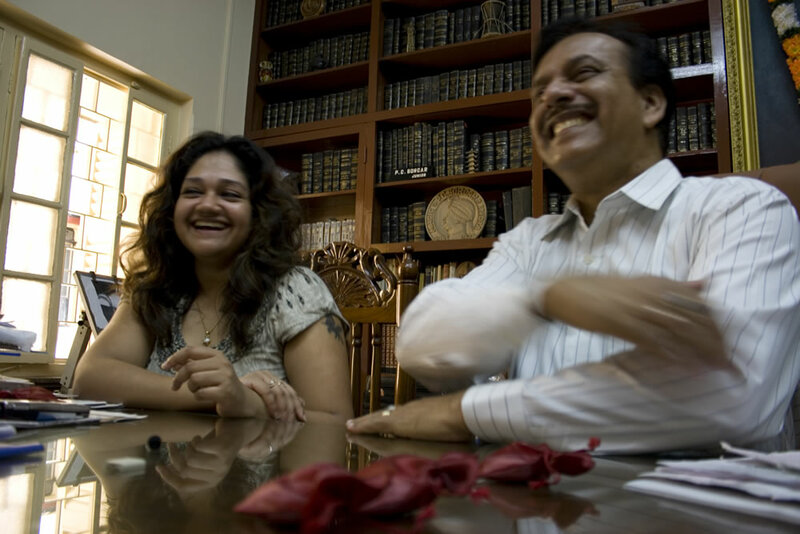 Sorcar JR—one of the most celebrated magicians in India—about the legendary “vanishing” of the Taj Mahal in Kachipura, Agra, on November 8, 2000. The work explores the possibility of employing magic and illusion to temporarily erase monuments and the narratives that they represent. Marcus Coates, Journey to the Lower World (2004). Two-channel video, 30 minutes. Courtesy of the artist and Kate MacGarry, London. Photo: Nick David. Investigating the relationship between shamanism and contemporary art, Marcus Coates’ dramatic and participatory events involve ritualized performances where he attempts to enter into the ‘lower world’ to communicate with spirits of dead animals. 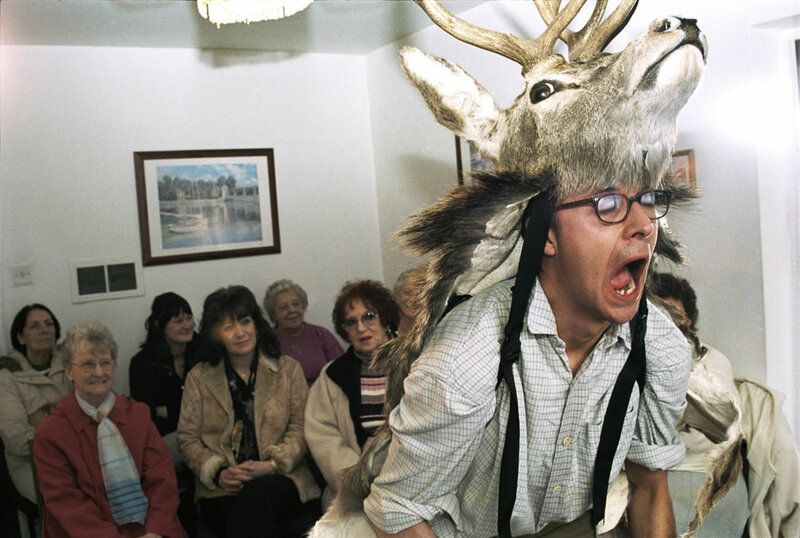 Journey to the Lower World (2004), documents one such ritual, which he performs wearing antlers and a reindeer pelt for a group of bewildered tenants from a condemned Liverpool housing estate. Joel Kyack, Local Records (Hill Street Blues) (2010). Performance. Courtesy of the artist and François Ghebaly Gallery, Los Angeles. LOCAL RECORDS is an ongoing series of projects where performance records are set in a specific site and community. These records are based around the number of times an action is repeated in a particular site over a 24-hour period. For Synthetic Ritual, Kyack will be performing a new Local Record live at Pitzer, in the 24 hours before the exhibition’s opening. Lawrence Lemaoana, Team Spirit (2006). 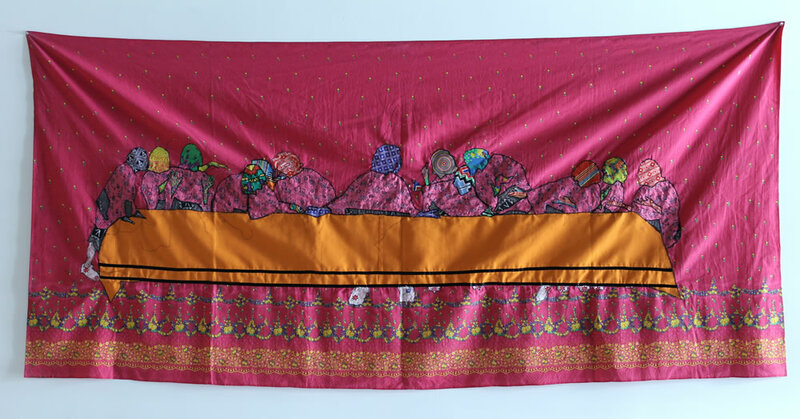 43.7 x 93.3 inches, cloth and thread. Courtesy of the artist and Josef Vascovitz. Fortune Teller #5 (2008) and All Things Fall Apart (2008) explore the relationship between sport, spirituality and politics as well as role of the mass media in shaping the psyche in present-day South Africa. Using textiles employed by local sangomas, the cloth—imbued with great spiritual significance—lends authority to the embroidered text. Yoshua Okon, Parking Lotus (2001). Lightjet C-prints, 40 x 30 inches. Courtesy of the artist and Kaufmann Repetto, Milan. As with many of Yoshua Okon’s works, Parking Lotus (2001), an early photographic installation, combines humor with poignant social commentary. Installed floor to ceiling, the photographs depict security guards meditating in lotus positions in various parking lots around Los Angeles, and it is accompanied by the “Meditation Movement Manifesto”—a text supporting the spiritual welfare of security guards. Adrian Paci, Vajtojca (2002). Film on DVD. Courtesy of the artist and Kaufmann Repetto, Milan. In Vajtojca (Mourner) (2002) Adrian Paci explores private and public mourning rituals. The video depicts a staging by the artist of his own death in his hometown of Shkoder, Armenia, where he was born. Employing a professional mourner, Paci is subjected to elaborate death rites and rituals while laid out on a table in a domestic setting. 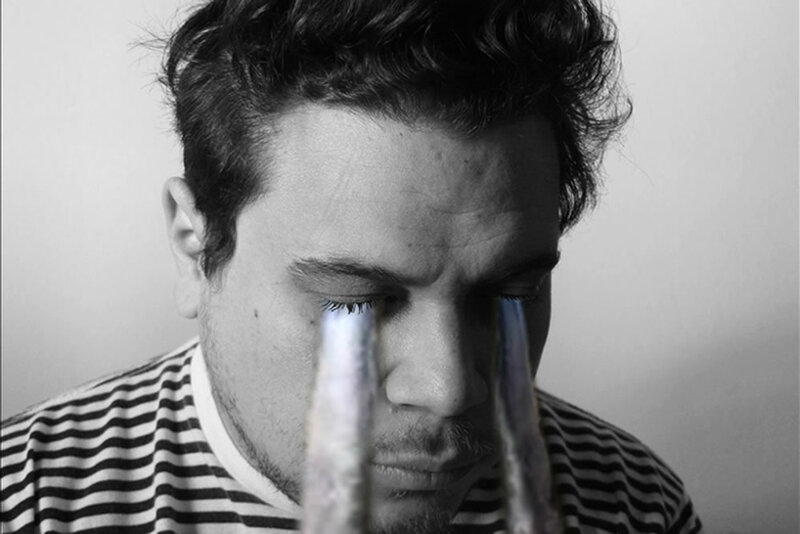 Marco Rios, Untitled (Weeping Video) (2010). Video, TRT: Continous loop. Courtesy of the artist and Simon Preston Gallery, New York. Untitled (Weeping Video) (2010) is a large-scale video portrait of the artist with streaming waterfalls tearing from his eyes. The work reveals his larger preoccupation with psychological and emotional states, and the exaggerated use of art historical references. 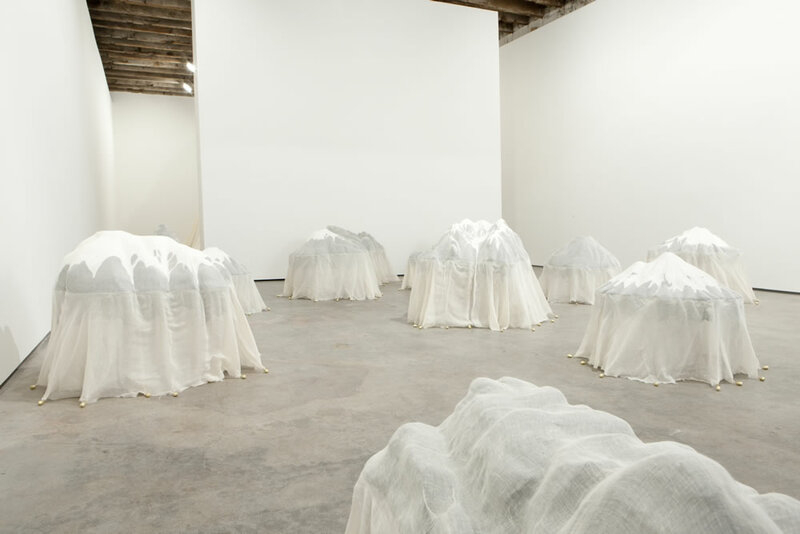 Kara Tanaka, Hungry Human (Mountain Hunter) (2011). Fiberglass, wood, foam, metal, cotton, paint, lead, gold leaf. Dimensions variable. Courtesy of the artist and Simon Preston Gallery, New York. The Hungry Human (Mountain Hunter) (2011) is a large sculptural installation depicting representations of sacred holy mountains found throughout the world, worshipped by pilgrims seeking enlightenment. Reflecting the larger history and conquest of these sacred sites, the work explores spiritual cultivation and the motivation for making grueling pilgrimages. Carlin Wing, Hitting Walls: In the Eye of the Beholder (2007). Single-channel video installation. Courtesy of the artist and Anthony Greaney, Boston. Carlin Wing’s roles as both an internationally ranked squash player and a widely exhibited photographer come together in her series of video and photographic works Hitting Walls. 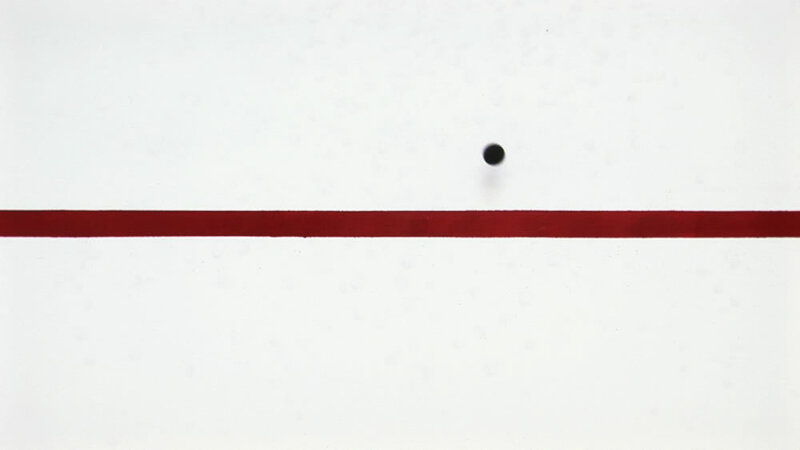 Wing’s video-loop In the Eye of the Beholder (2009) records the moment when the ball hits either side of the central horizontal line, of the front wall of a squash court, with singular focus and stark economy. Amir Yatziv, Compressed Ceramic Powder #2 (2007). Single-channel video, 6 minutes. Courtesy of the artist. 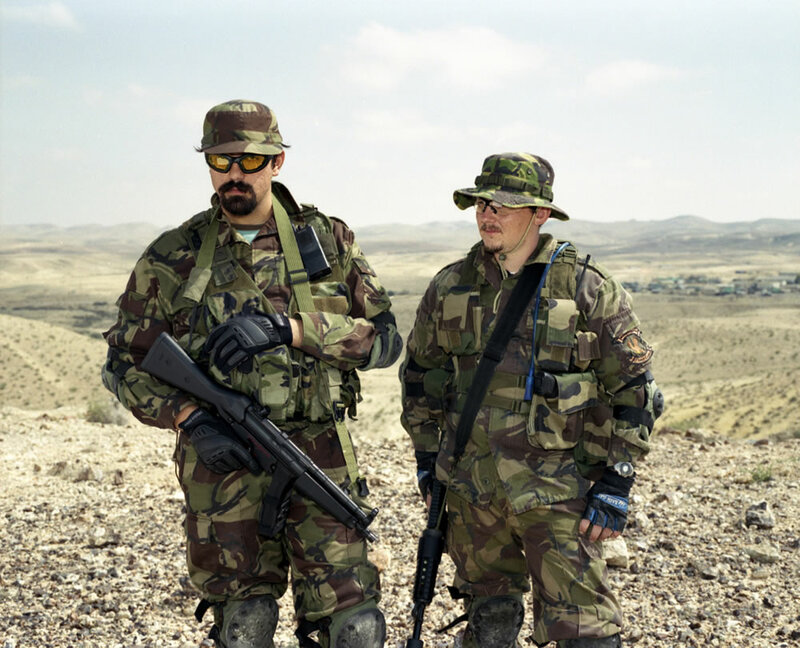 Amir Yatziv’s Compressed Ceramic Powder (Battle in the Orchard) (2007) is a video installation featuring a group of young Israeli men solemnly describing their last moments in battle before death. This surreal adherence to the Israeli narrative of martyrdom is disturbed once it is revealed that the soldiers lost a paintball battle, not their lives. Gabi Scardi is an international curator and art critic based in Milan. She is a curatorial advisor for MAXXI (Museum of the 21st Century Arts) in Rome and co-curates CECAC (European Course for Contemporary Art Curators) – Fondazione Ratti, Como, Italy and Province of Milan. Between 2005 and 2009 she was the Contemporary Art Advisor to the Province of Milan . She has curated numerous exhibitions internationally including Aware: Art, Fashion, Identity at the Royal Academy of Arts in London (2010). At the Lyon Biennale in 2009, she organized T.A.M.A. – Project “Side Effect”, a collaborative project examining the situation of Romas in Europe. Her other projects include Yoshua Okón, Canned Laughter, Viafarini, Milan, (2009); Libia Castro & Òlafur Òlafsson, Riccardo Crespi Gallery, Milan, (2009); The Mobile Archive, Viafarini Care of DOCVA, Milan, (2009); Marina Ballo Charmet, Parco, Triennale, Milan, (2008); Stéphanie Nava, Considering a Plot (Dig for Victory), Viafarini, Milan, 2008, Alfredo Jaar, It is Difficult, Spazio Oberdan, Hangar Bicocca (2008), Debora Hirsch, BR-101, Fondazione Olivetti, Roma, (2008); LESS, Strategie alternative dell’abitare, PAC Padiglione d’arte Contemporanea (Pavilion for Contemporary Art), Milan, (2006), and LESS#1 Alternative Living Strategies, section of Gwangju Design Biennale (2007). In addition, Gabi Scardi teaches courses on Contemporary Art and Public Art at Università Cattolica, Milan; Politecnico di Milano, Faculy of Design, Milan; Università Bicocca, Faculy of Sociologioy, Milan; Domus Academy, Milan; TSM – Trento School of Management, Trento. Opening Reception: Wednesday, September 28, 5-8 p.m.
Curator’s Walkthrough: Wednesday, September 28, 5-6 p.m.
Wednesday, October 12, 2011, 1:30 – 3:00 p.m.